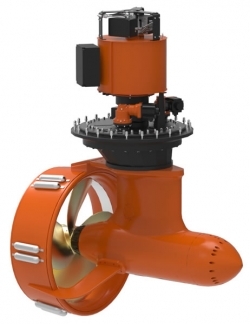 With its hybrid propulsion package and patented designs, Thrustmaster delivers a complete turnkey solution, consisting of new, high-efficiency, permanent magnet motor electric podded azimuth thrusters, battery banks, diesel gensets, VFDs, controls, and power management systems. The company will showcase its T-Pod electric podded thruster for diesel-electric and hybrid propulsion solutions. The thruster comprises a podded permanent magnet electric motor directly driving the propeller. There are no angled gearsets in the thruster, unlike in traditional thrusters. The Thruster T-pod is lower in weight, higher in efficiency, and very compact. Thrustmaster has recently purchased the IP rights for Rolls-Royce’s dynamic position (DP) product, which means it will be in a position to offer complete thruster and DP controls solutions to customers, enabling a more seamless application in their projects.